Also, I received many e-mails requesting a banana substitute. Since I never give up, I went back into the Snack Girl test kitchen (my kitchen) to redesign my snack. It was painful, but I HAD to do it. I decided to use canned pumpkin because it has a sweet flavor and you don't have to cook it. Whatever you do, do not waste your time looking for pumpkin next to the other canned vegetables or fruits in the supermarket. It is found in the BAKING section on a very low shelf. Yes, I was resenting the banana haters as I searched through the massive store on the hunt for pumpkin out of season. - but I am over it (not). You can find it - and it works! The biggest difference is that pumpkin has more water in it - so it took me longer to cook these than the banana ones. They turned out slightly crunchy on the outside and soft on the inside and THIS time - my entire family like them (they were gone in 2 days flat). I did add maple syrup to make the batter sweeter - but this is a matter of personal preference. Go ahead and taste them before you add any sugar to see if you like the flavor. Did you try the cereal bites recipe? What did you think? Preheat oven to 350 F. In a food processor, coarsely chop nuts and dried fruits. Mix nut butter and pumpkin until a well blended. Add the rest of the ingredients and mix. Taste to ensure the right level of spice and sweetness. Spoon into lightly greased muffin cups and bake for 30-35 minutes. Can be stored in refrigerator for 5 days. I really love banana, but I really pumpkin too! Pumpkin is found year round in stores near me. Must be a New England thing. That, and I've heard it's healthy to add to your pet's food. I definitely DON'T hate bananas, but I think the pumpkin ones appeal to me more. I have given in and printed out *both* recipes. I hope to try making them one of these evenings. I love bananas on their own, but hate them cooked or added in something or banana flavored things. Strange, I know. 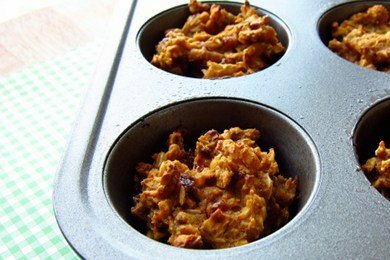 I love bananas and pumpkin and these ideas are great! I've made nut/fruit snack bars using dried fruit like apricots. Pour boiling water over dried fruit and let it sit until it plumps a bit. Drain and reserve liquid and add to the food processor. If you don't want to bake them - coconut and/or seeds (sunflower) can help dry them out to make them read to go! I also love bananas but these look great. Can't wait to make them..Off to the store to get pumpkin. They have canned pumpkin the organic section year-round at my grocery store. I think it tastes terrible, though. I much prefer the stuff in the baking section. I am so excited to make these. They look delicious! Thanks snack girl! I look forward to this, I am a banana hater also and I was really excited to see this ! I cooked a batch of the banana ones and they were an instant hit with my family; I just popped some of these guys in the oven and they already smell heavenly. My daughter loves oranges and asked if I could make some "granola circles" with oranges in them. Do you have any suggestions as to how I could go about this? Thank you! @Whitney - I would use the pumpkin recipe and add 1 tablespoon of finely grated orange peel - that should give it an orange flavor. Since it is fall I am going to try out the pumpkin recipe to celebrate the season! These are sooooo yummy! I made my first batch a couple of weeks ago and have been craving them since. My second batch is in the oven now. I can't wait! I'm wondering if anyone has tried freezing these or tha banana version? My son eats gluten free, and I like to have snacks easy to grab for him. Making a batch and freezing leftovers would be easier, and would last a couple of weeks.